This post was written by Hatchet staff writer Carson Rolleri. 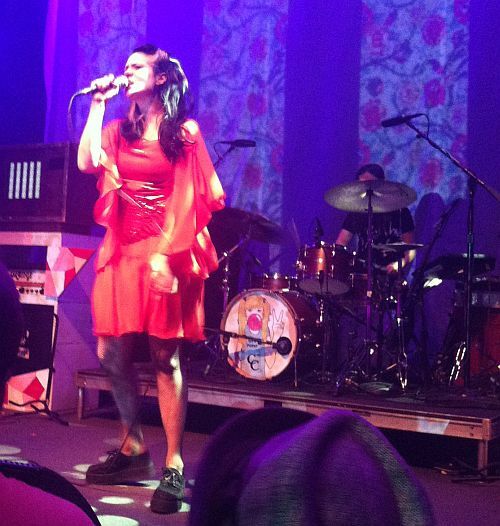 When Kate Nash took the 9:30 Club stage Monday night, the audience heard more than clashing guitars and quirky, quippy lyrics. Nash made it personal, talking about bad friends, empowering women in music and that one time she found string cheese wrappers in her bed. The show embodied Nash’s own contradictions: at once serious and angsty, yet playful and full of the fun energy the English singer is known for. She made sure there was never a dull moment, from talking about her lowest lows to thrashing around on stage and even crowd-surfing. The show’s openers highlighted the two extremes of Nash’s style. Skating Polly, a two-woman punk rock duo, was deeply rooted in its genre: Songs like “Placer” mixed softer music with strong, jarring vocals that created a deliberate discord with the music. Second opener La Sera brought a mellow-rock feel with songs like “Running Wild,” which she explained was about “losing control and eating all of the cupcakes” — literal cupcakes, in this case, which she gave out to audience members between each song. Nash’s entrance highlighted the theatrics of her physical set design, with a two-minute music video playing from five retro televisions that adorned the stage. The nostalgic vibe paired with the energetic lyrics of being more than “a toy” set a playful the tone for the rest of the show, rife with witty lyrics and Nash’s seemingly inexhaustible energy levels. The first part of Nash’s set stayed true to the more punk-inspired tone of her newer album, “Girl Talk,” with songs like “Sister” and “Kiss That Grrrl” capturing the raw angst and aggression packaged with the strong energy typical to Nash’s style. The set also included fan favorites like “Foundations” and “Merry Happy” which were laced with the tinges of her new, gruffer sound. Nash’s final song saw audience members joining Nash on stage and jumping into the crowd, closing out the night with a prolonged jam session with her musicians, the “girl gang,” and the clamor of audience members dancing across the stage.